The Twain Shall Meet: Mrs. Harper? Can Stevie Come Out and Play? Yesterday, Stephen Harper, in a moment of panic and confusion bravely challenged the leader of the Liberal Party of Canada, Michael Ignatieff to a One-on-One, Face-to-Face, Man-to-Man Debate. Although many of us who follow very closely and really understand the problem-child leader of the Conservative Party of Canada were sure that he was not only putting his bid to keep Canada on the road to becoming "Haperland", in grave danger, but that he would weasel out of it! 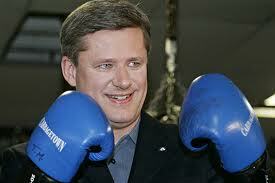 Today, he has backed out citing the Canadian Media Consortium and their apparent disapproval. I am left wondering if that is really the reason that he cancelled this chance to show how his intellect aligns with one of the world's most admired minds. I suspect that there are many many other reasons! The Consortium of (CBC, CTV, Radio Canada, Global, and TVA) Canadian Broadcasters who are putting together the traditional mid-campaign encounter of the major party leaders have so far ruled out hosting a separate Harper vs. Ignatieff event. Harper says that that settles the issue for him, but Ignatieff quietly scoffed at that. Just for interest sake: He also said that he and the Liberal Party favour Elizabeth May's inclusion in the debates. A stance that Harper has not yet clarified. Harper may not always play by the rules, but when they favour him or his agenda, or he can find a loophole, he he will take advantage of them and scurry to a safer position. I am afraid he is running out of places to hide. The prime minister , who is NOT actually the Prime minister these days but should be referred to as the leader of the Conservative party of Canada during the election period, says with a straight face that Michael Ignatieff is to blame. Note that he also insanely blamed Michael Ignatieff for Canada's failure to get a seat on the UN Security Council last year. 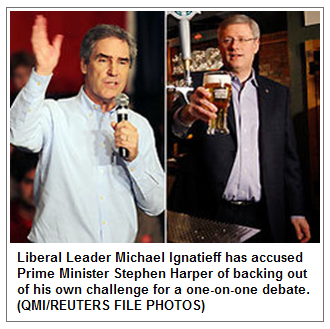 Apparently according to Harper, Michael Ignatieff is a very powerful man. One of these responses is quite serious and factual, the other, much less so. I'll let you decide which is which. This video should help! Mr. Harper may be well advised to keep himself out of the public sphere for the next 30 days, as he did during the last election and ^NOT to get into the ring a man of Doctor Ignatieff's intellect and much quicker left! I mean seriously? Does this man look like he is up to the job? On a Side-Note: In a flourish of whimsy, wit and wisdom Michael Ignatieff blythely opined, the other day, while in Mississauga, that Stephen Harper might just want to bone up on what it means to be a Canadian. I wholeheartedly agree. Hey Stevie? If you can^NOTcome out to play, and we already know you like to hide out, and if you are going to be hiding in the basement of OUR HOUSE, why not take the time to read this!